A new smooth lining on the inside of your existing sewer pipe. Put our 100 years of experience to work! Our equipment, knowledge, and experience gets the job done where others have failed. The Pipe Bursting method uses the existing damaged sewer line as a conduit and guide for the new pipe. A cone shaped, path clearing, bursting head, with the new pipe attached is pulled through the old pipe. As the installation head passes through the existing pipe, it actually pulls in a full size replacement pipe. After installation of the new pipe is complete, it is simply connected to the existing system. This code approved pipe is completely root-proof, and chemical/acid resistant, designed to last 100 years. 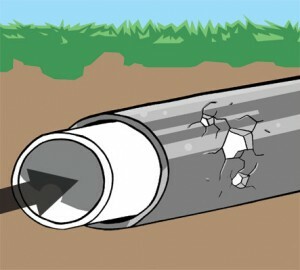 View conditions inside pipes; takes the guess work out of sewer problems & repairs. Residential Only. From outside clean out location, up to 75 feet of pipe. No roof vents. Excludes emergecy service. Prior Appointment Required.